The volcanic island of Tenerife is the biggest of the Canary Islands and has been a magnet for sun-seekers for many years due to its sub-tropical climate. The Coast of Africa is a mere 160 miles away. In the south of the island, Playa de las Americas is known as a holiday mecca for young people - a huge, sun sea and sand purpose-built palace that never sleeps. But today, the resort is working hard to attract families and couples. By way of contrast, visit Teide National Park, home to Pico del Teide, one of the world’s biggest volcanoes. This is Spain's highest mountain topped by a vast volcanic crater. You can cheat and take the cable car to get to its 3,718-metre-high peak or do it the hard way walking up along the trails. Either way you will be rewarded by some stunning views. 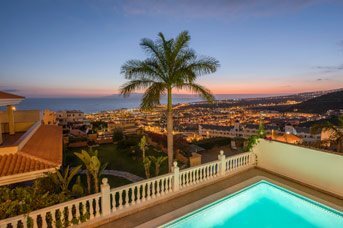 Tenerife has wonderful beaches, but there is so much more to the island than the major tourist holiday resorts, including La Laguna - Tenerife's second most important city and former capital of the island until 1723. The city is full of interesting buildings including San Fernando University and the Bishop's Palace as well 17th and 18th century houses with brightly-coloured facades, elegant churches and an impressive cathedral. The city is surrounded by the luscious countryside of the Aguere Valley, just inland from Santa Cruz. If you like dramatic mountain scenery you could visit Masca, a small picturesque village with a total population of around a hundred people. Or you could check out mysterious Piramides de Guimar, a group of six stepped pyramids on the East Coast of the island. No one knows for sure how or why they are there. It is also worth spending a day in the capital, Santa Cruz which has good shops, a spectacular new opera house on its waterfront and some great cafes and restaurants. Go to the top of Mount Teide! There is plenty to keep you busy on the western side of the island including water sports galore at Fanabe and the all-important golf courses. Fanabe offers stretches of Blue Flag man-made beach lined with upmarket shopping centres with every kind of shop you can imagine – and some you can’t! 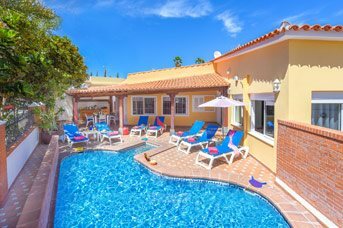 Costa Adeje is an upmarket family-focussed resort with blue flag beaches and an atmosphere of laid-back sophistication. The marina has elegant waterfront restaurants, an enviable live music scene and great cabaret. Tucked away in the south western corner of the island, Callao Salvaje is a civilised, self-contained sort of place with all the basics covered such as shops and supermarkets to stock your villa with essentials and also restaurants and bars. There is so much to do in Tenerife you might just have to stay an extra week - or come back at a later date! Then there are so many restaurants to try – you will not be doing much cooking at your villa! So many beaches, so little time – will you go to the dark volcanic strip at Playa Fanabe or the golden, imported sands of Playa del Duque? This is an island of exquisite beaches and dramatic mountains, of amazing flavours and aromas in top class restaurants, of sophisticated designer boutiques, elegant marinas and chaotic street markets. To enjoy all this and so much more, just choose which of our beautiful villas will be yours, with everything you need to be happy and comfortable, including a lovely, cool calm bedroom waiting for you after the heat of the day. Imagine swimming at dusk in your own private villa pool, planning the day ahead and marvelling at the day you have just spent in this magical place with the people you love best. 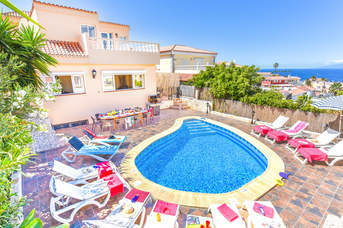 You are imagining your Villa Plus holiday - it is all there waiting for you. The volcanic island of Tenerife is the biggest of the Canary Islands and has been a magnet for sun-seekers for many years due to its sub-tropical climate. The coast of Africa is a mere 160 miles away. In the south, Playa de las Americas, never sleeps and is purpose-built palace of sun, sea and sand. Today, the resort is working hard to attract more families and couples. By way of complete contrast, ther is the natural beauty amongst the wildflowers of the Teide National Park, home to Pico del Teide, one of the world’s biggest volcanoes. This is Spain's highest mountain topped by a vast volcanic crater. You can cheat and take the cable car to get to its 3,718 metre high peak or do it the hard way walking up along the trails. Either way you will be rewarded by incredible views of the island. Tenerife has wonderful beaches, but there is so much more to the island than the major tourist holiday resorts. There is La Laguna, which was Tenerife's second most important city and former capital of the island until 1723. The city is full of interesting buildings including San Fernando University and the Bishop's Palace as well 17th and 18th century houses with brightly-coloured facades, elegant churches and an impressive cathedral. The city is surrounded by the luscious countryside of the Aguere Valley, just inland from Santa Cruz. If you like dramatic mountain scenery you could also visit Masca, a small picturesque village with a total population of around a hundred people. Or you could check out mysterious Piramides de Guimar, a group of six stepped pyramids on the east coast of the island. No one knows for sure how or why they are there. It is also worth spending a day in the capital Santa Cruz which has good shops, a spectacular new opera house on its waterfront and some great cafés and restaurants. 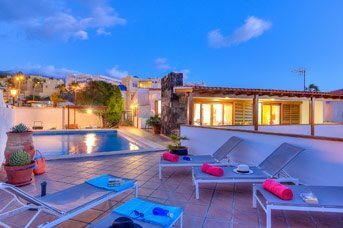 If you want to be close to everything that that Playa de las Americas has to offer, without being in the heart of the action, a villa in Callo Salvaje is a good choice. From here, you can explore the whole island and be home in time for dinner. Tucked away in the south western corner of the island, Callao Salvaje is a civilised, self-contained sort of place with all the basics covered such as shops and supermarkets, restaurants and bars. 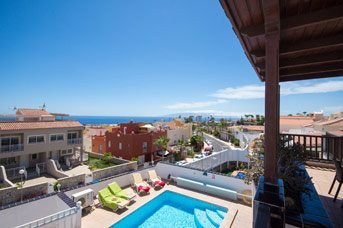 Chayofa is a beautiful village set on the hillside which has stunning views over the Southern Coastline and yet just a 5 minutes’ drive away from Los Cristianos and Playa De Las Americas. Costa Adeje is a very family-focussed place and people working here are inclined to make a big fuss of children and spoil them rotten. Children can run wild in the nearby water parks, relax on the beaches and get out and explore the wildlife out at sea and up in the national park. A beautiful and exclusive area, which has been developed largely over the last 5 or 6 years, Fanabe offers stretches of wonderful Blue Flag man-made beaches and upmarket commercial shopping centres with every designer shop imaginable. Playa de las Americas is only a few minutes’ walk along the promenade and offers every type of restaurant imaginable. Often described as a sleepy village, La Caleta has kept its original character of a traditional fishing community, with some very good seafood restaurants. You’ll be in a great spot to explore the island, with Playa de Las Americas just 15 minutes’ drive away. 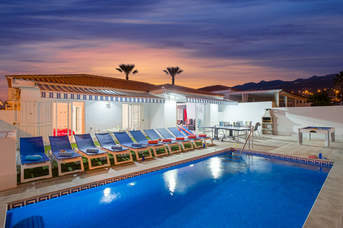 A small resort conveniently located between Tenerife South Airport and Los Cristianos - both only 15 minutes away by car. Playa de la Arena is characterised by its rugged coastline and black volcanic beach. The Mount Teide National Park - Tenerife’s inland natural – is also within a short drive. Nearly half of the island's natural spaces are protected, and Tenerife offers something for everyone, with the world heritage site of the Teide National Park, picturesque villages and historical centres. A day trip to the Teide National Park makes a complete contrast to life on the coast, allowing you to enjoy the natural beauty of wildflowers rather than the more commercialised life on the coast. Teide National Park is home to Pico del Teide, the third highest volcano in the world and a UNESCO World Heritage Site. This is Spain's highest mountain topped by a vast volcanic crater and featuring trails of otherworldly solidified lava. Massive and beautiful,it will make you feel very small. You can cheat and take the cable car to get to its 3,718 metre high peak or do it the hard way walking up along the trails. Either way you will be rewarded by incredible views. You’ll be amazed at what manages to grow here! The plants have to cope with high altitude, intense sunlight, extreme temperature variations and lack of moisture, but even so, the diversity of plant species here is amazing and there are some that are not found anywhere else. Golf is not so much a game as a way of life. It’s a very serious business in Tenerife as it is throughout Spain. Golf Las Americas is an 18-hole course with stunning views, verdant greens and lakes that twist and turn through the landscape. The course measures 6,607 yards and provides a challenging yet rewarding setting in which to show off your skills. Sheraton La Caleta Resort and Spa is designed around The Golf Costa Adeje Course, which has dramaticmountains on one side and the blue Atlantic Ocean on the other. There is an 18-hole and a 9-hole course, and they both cleverly incorporate the natural characteristics of the landscape. The Ritz-Carlton resort - a 400-acre exclusive 'luxury destination' - has the Abama Golf Course at its beating heart. The 18-hole course opened in 2005, designed by Dave Thomas to combine large greens and wide fairways enabling a wide range of players to enjoy its challenges. There are fantastic water features throughout. To give you an idea of scale, it has over 25,000 trees and 22 lakes! Rising to 480 metres above sea level, it has great views of the Atlantic Ocean and the island of La Gomera. Siam Waterpark, in Costa Adeje, has been described as one of the world’s biggest and best. Three major attractions give it the edge: the Tower of Power, a near-vertical slide with a jaw-dropping plunge ending up in an alligator's pool, Dragon, a funnel-shaped slide which is the only one of its kind in Europe and apparently makes even the cool guys scream, and Wave Palace, a giant wave pool similar to the one in Disney World's Typhoon Lagoon in Florida.There over 30 rides altogether, and countless slides and pools to slip and splash around including the world’s biggest lazy river with a whirlpool style finale. Or try Aqualand is a brilliant water park close to Playa de las Americas. Children love it, especially the fantastic dolphin show. The rides and slides rides range from gentle to white knuckle and there are waterfalls, children's play areas, climbing frames and sun bathing terraces as well as restaurants, cafes, snack bars, shops, sunbeds and parasols. Calling all windsurfers! The beaches are a massive draw at Playa de las Americas and there are six to choose from with a mini-train that trundles between them. There are plenty of water sports at any of them, but Playa de Guincho is the one surfers and windsurfers like best. Playa de Guincho is located just a short distance away from the main beach, Playa de Troya. Guincho is a magnificent beach, popular for water sports such as kite and wind surfingbut it is not ideal for sunbathing due to its rocky shore. The sand in Playa de Guincho is an attractive caramel shade, and the whole beach seems to be a bit cut off, rather like a secret hideaway. On days when the sea is rough, large waves provide some good surfing opportunities for novices. More experienced locals prefer to look for better surf conditions just behind the Conquistador Hotel. There are various schools offering tuition and rental for surfers, while diving can also be booked through tour operators and instructors. Swaying palm trees, picturesque views over the Atlantic with amazing sunsets, and great promenades are all good reasons for visiting the beaches in Tenerife. From natural black sand beaches, small pebble coastal coves to large golden sandy beaches, Tenerife has a variety of places to offer. The larger tourist areas of the south boast some of the best beaches in Tenerife, ideal for snorkelling, swimming, surfing and topping up your golden tan. Many of the larger beaches offer plenty of the usual watersports activities, and with most beaches offering sunbeds, beachside showers and plenty of places to eat and drink, you should find everything you need for a relaxing and fun day. Situated at the far end of the Palm Mar resort promenade you will also find Bahia Beach with the Bahia Beach Bar which is a more up market chill out restaurant and beach club. Here sun loungers can be rented for a fee. Callao Salvaje Playa De Ajabo Beach is a man made beach with typical Canarian black volcanic sand, lined with pretty shrubs leading down to the sea. The sheltered bay means the wind and waters are calm - perfect for sunbathing and swimming. The beach is easily accessible and has good facilities including toilets, changing rooms and a snack bar. Torviscas and Fañabé beaches are on the coast of Costa Adeje, one of the main tourist resorts in Tenerife. These neighboring beaches make up one long, sandy beach.They are joined by one long, popular promenade where many people relax and enjoy the beautiful sunshine at some of the best known beaches in Tenerife. The sea is mainly calm,apart from El Duque beach where it is a little rougher. These beaches offer a complete range of facilities and a great atmosphere of non-stop fun. 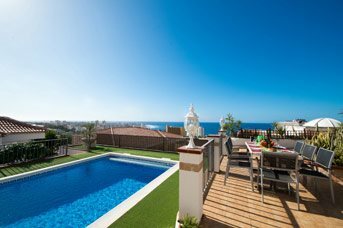 Playa Del Duque is a beach of fine golden sand located in one of the newest areas of Costa Adeje and bordered by a lovely seafront promenade, which joins together over 8 beaches. The sea is calm and the beach extends for almost 765 yards. The playa Del Duque is sure to please all who visit, especially as it has all the services you would expect from such high quality surroundings. There is a sun lounger and parasol service, as well as parking, restaurants, bars, showers, changing rooms, toilets and telephones. The Enramada Beach is located in the Adeje Cove, near Playa de Las Américas. This old pebble beach has been remodeled to make it easier for bathing. It is now covered with fine, volcanic sand produced by grinding down the original pebbles and excavating sand from the seabed around Los Cristianos Beach. It is a beach with quiet waters located in a semi-urban setting. El Camisón is one of the many beaches between the tourist resorts of Los Cristianos and Costa Adeje. It is 131 yards long and makes up part of a continuous succession of beaches which are occasionally separated by a line of stones laid on the sand. As with all these beaches it has a wide range of services and facilities both on the beach andjust the other side of the promenade. A popular beach throughout the year, it offers a range of enjoyable water sports and an easy-going atmosphere. Swimming conditions are excellent due to the breakwater, which protects the beach from currents and waves. El Médano Beach is in the district of Granadilla de Abona, next to the small seaside resort of the same name. It is the longest beach on the island, 1¼ , mile stretch of fine golden sand that ends at a volcanic cone called "Montaña Rojo" (Red Mountain). The surrounding area is a protected nature reserve due to its important ecologicalvalue. The beach has a range of facilities and a very pleasant seafront walk to stroll along. Above all, El Médano beach stands out for being the ideal place to go windsurfing. The winds in this area, especially from spring to September, do not deter other beachgoers who enjoy the calm, shallow waters of this beach and a family-friendly atmosphere where locals and tourists from all over the world mix happily together. Connected to El Médano beach via the Montaña Roja nature reserve is La Tejita beach, a ¾ mile long beach of fine golden sand that is set well away from the town. Right next to the spectacular Montaña Roja is this small cove which makes a cosy beach, mainly used by nudists. This beach has no facilities, except a small stand selling drinks.However, it is exactly this natural environment, its clean sand and calm waters that attract visitors to this beach. Las Vistas is one of the longest beaches in the south of Tenerife. It has a wide range of facilities, and its fine golden sand comes from the surrounding seabed. Las Vistas Beach is a man-made beach, one of the most popular beaches in Tenerife. It is located between the resorts of Los Cristianos and Las Américas and thanks to its breakwater,which protects it from waves and ocean currents, the sea is calm and ideal for swimming. A fountain, with a very contemporary design capable of shooting seawater high into the sky, is one of this beach's unique features. Pedal boats and jet-skies are available for hire. The beach, Playa Arenita, is enjoyed by bathers and swimmers and the rocks that jut out at various points are popular fishing stands. It is a perfect place to snorkel and scuba and boast a small beach bar with straw umbrellas and beds for hire. Called locally a “chiringito” the beach bar is a perfect place to sip a cocktail and watch the sun set behind the neighboring island of La Gomera. At the far end of the promenade you will also findthe Bahia Beach bar which is a more up market chillout restaurant and beach club. Then add that the Los Cristianos beaches are 10-15 mins away. Playa de Las Americas boasts the Playa de Guincho, which is popular with surfers and windsurfers, though it is a bit rocky for sunbathing. The main beach, Troya Beach, is a much more comfortable and sandy option, with other watersports on offer, as well as a good choice of bars, cafés and restaurants. This was the first beach at Costa Adeje. It has fine golden sand and calm seas and is located ina very central area. The sea is great for practising water sports. There is a lifeguard service, sun loungers and parasols for hire, parking, restaurants and bars, showers, changing rooms and a taxi rank and bus stop nearby. Playa de Los Cristianos is a sweeping black sandy beach right by the harbour. Watersports and a childrens' play area are available to all. The calm waters in the sheltered bay are great to cool down in. A very pretty beach with a wonderful view of the harbour. There is also a rocky, black sand beach in the Rincón area of Los Cristianos. Located in the heart of the small tourist resort of Puerto Santiago, La Arena beach stands out for its excellent setting and extraordinary amount of light. The beach is 130 yards long with fine volcanic sand and a full range of facilities. There are a number of restaurants and shops, and the nearby hotels make for one of the most family-friendly beaches for locals and visitors alike. Playa La Pinta next to Puerto Colon is on the coastal walk way and you can go in either direction to Los Cristianos or the other way La Caleta. Playa La Pinta has a soft sandy beach that slopes gently to the sea with safe swimming. Sun beds are available for hire at some of the lowest rates on the island and there's lots of beach left for those who just want to place their towels on to the sand and chill out. There are also watersports and a floatingplay area for hire for all age groups. On the coast of Costa Adeje, one of the main tourist resorts in Tenerife, the neighboring beaches of Torviscas and Fañ,abé, make up one long, sandy beach. The sea is mainly calm, apart from El Duque beach where it is a little rougher. These beaches offer a complete range of facilities and a great atmosphere of non-stop fun. They are joined by one long, popular promenade where many people relax and enjoy the beautiful sunshine at some ofthe best-known beaches in Tenerife. When it comes to shopping for food on Tenerife, as with most places in the world, the locals know best. Farmers markets are the best place to source fresh ingredients grown here on the island, from fruit and vegetables to mojo sauces, cheeses, breads and wines as well as fish, seafood and meats. Markets are where the locals flock for their produce, and as you wander among the laden stalls overflowing with vibrant, colourful vegetables, succulent meats and freshly caught fish and seafood, you'll understand why. Not only are they usually cheaper than buying from the supermarket, but the charm and atmosphere of markets give you a real taste for the local culture. You'll find a full run down of the best markets on the Villa Plus Tenerife Guide. Adeje market is the most easily accessible for holidaymakers staying in the area, opening on Saturdays and Sundays 8am to 2pm and 4 to 8pm on Wednesdays. 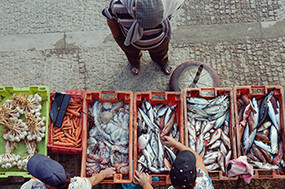 You'll find everything you need here to cook mouth-watering local dishes.La Laguna market is one of the biggest on the island, where you'll find salt cod stacked high, a vibrant array of spices and vegetables, as well as skinned goat – a local favourite. The cuisine of the Canary Islands is primarily Spanish in origin, although there is also a presence of African spices and influences of Latin America. 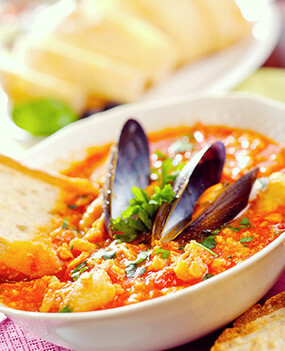 Traditional local dishes are simple and unpretentious, with fish and seafood featuring heavily on the menu. While meats like beef and pork are available, these are usually imported – the only meat really reared on the island is rabbit and goat, which you'll only find on the menu in truly local restaurants. Tapas restaurants are found in abundance on the island, offering the typical Spanish dishes with additions local to Tenerife. Mojo sauce– this is served as a side dish to be added at the diner's taste. Mojo picon is made with hot and sweet red peppers and has a spicy flavour, while mojo verde is made with parsley, coriander and garlic and has a smooth mild flavour. Papas Arugadas– literally translating to wrinkly potatoes, this is a simple dish of potatoes boiled in salted water which leaves a salty layer on the skin. The dish is usually served with red and green mojo sauces. Sancocho Canario– a typical fish stew or casserole native to the Canary Islands, it is made using salted white fish, potatoes and mojo sauce. 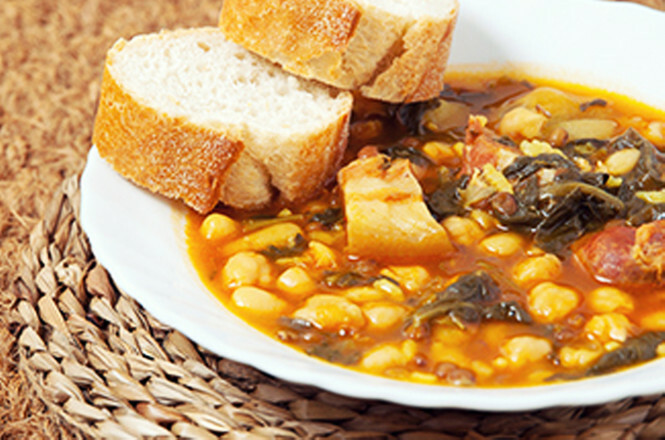 Get a taste for the local cuisine before you arrive in Tenerife with some simple traditional recipes that are easy to create at home. It's a great way to find out which flavours and dishes you'll enjoy, meaning you can make the most of your time on holiday and find the perfect restaurants to dine in on the island. 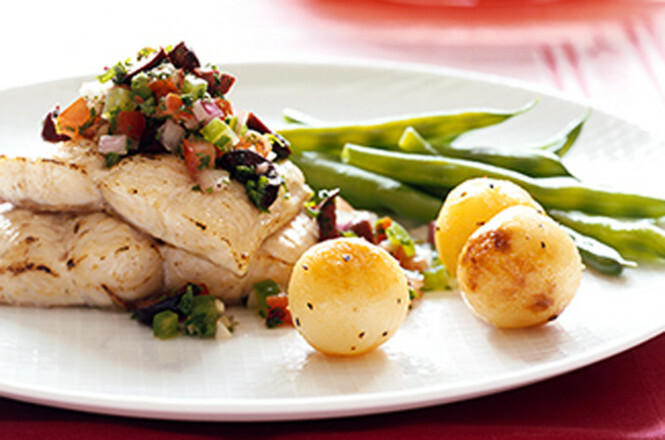 This simple dish typifies Canarian cuisine – fish, salted potatoes and a red mojo sauce. Peel and slice the potatoes. Boil in salted water for 5 minutes, then add the fish and cook for a further 5 minutes, until the potatoes are cooked. While the fish and potatoes cook, prepare the mojo sauce. In a food processor add the garlic cloves, hot pepper and cumin. Blend, then add salt, paprika and vinegar and gradually add the oil. Add a little of the water from the fish and potato pan. Drain the potatoes and fish, and serve plated with the mojo sauce on top. This chickpea stew uses pork and the initially rather less appetising ingredient – pig's trotters – to create a thick consistency and a wonderful deep flavour. You can usually get hold of pig's trotters at your local butchers, but if you'd rather leave them out simply use a pork stock cube instead to add flavour. Soak the chickpeas, ribs and trotters if they are salty each in a separate container overnight. Add half a teaspoon of bicarbonate of soda to the chickpeas if you prefer them softer. Once soaked overnight, place the three ingredients together in fresh water and bring to the boil on a low heat. Slice the salted pork and chorizo, and add to the pot after 20 minutes of boiling. In the meantime, finely chop and lightly fry the garlic, onion, tomato (peeled and seeded) and pepper. Take off the heat and add paprika, then, add the mixture to the pot and mix well. Add the bay leaf, pepper, cumin and saffron. Peel and dice the potatoes and fry lightly in oil ready to add to the mix once the chickpeas are almost done. Season with salt if desired, but as there are many salty ingredients used here, be sure to taste first before over seasoning!